Fergus Falls is a river city, it was settled when transportation and industry were dependent on water power. It was the river that attracted investors who recognized the rapids along the river as a sign of future prosperity. In 1857, Little Falls entrepreneur James Fergus hired Joe Whitford to look for potential townsite location along the Red River. A band of Ojibwe Indians told Whitford of a spot with “swift water” along the river. Whitford explored the area, saw the potential to harness the rapids for water power and staked a claim. He called the site Fergus Falls in honor of his employer. James Fergus heeded his friend’s advice as he decided against moving to Fergus Falls. He eventually went to Montana where he became a wealthy rancher and had a county named after him with Lewiston as the county seat. The Civil War and Dakota Conflict stymied further settlement. The 1862 Homestead Act, however, planted the seed for future settlement. The Homestead Act allowed anyone to file for 160 acres of public land if after five years improvement was made upon the homestead. The act was perhaps the most important piece of legislation to open up the country to settlement. When the Civil War ended in 1865, there was a great push west to settle uncounted acres of land. Land offices were set up as surveyors began the process of mapping out land. Vermont native George B. Wright was an assistant U.S. Government surveyor who while surveying the abandoned Fergus Falls townsite, realized the potential of harnessing water power. He quit surveying and with his partner R.J. Mendenhall, purchased the townsite and laid it out into lots and blocks. He arrived in 1870 and broke ground for a sawmill, constructed a dam (Central Dam) and built a bridge across the river (Cascade St). Wright set the townsite in motion. He called Fergus Falls the “Coming City” extolling its water power in the finest wheat growing region of the northwest. He also offered free lots to anyone willing to put up a business. Fergus Falls became the county seat in 1872 and when the Northern Pacific railroad came through in 1879, the success of the town was ensured. Settlers and businesses had a scheduled line into town and locally produced good had a year-round route out of the area. Log constructed in 1871. Iron truss bridge in 1891. Concrete bridge in August 1955, current bridge in 2007. Site where George B. Wright built his first dam in 1870. Fergus Falls experienced its greatest flood on September 24, 1909, when City Dam collapsed two miles east of town. Built just one year earlier to provide the city with electric lights, the dam went out at 4:30 a.m. Other dams and bridges downstream were either wrecked or damaged and basements on the south side of East Lincoln were flooded with five feet of water. Central Dam held but the water cut a broad channel around the west end. Otter Tail Power purchased the dam and rebuilt it in 1921. Today Central Dam generates about 500 kilowatts of electricity for the city. Among the first buildings in Fergus Falls were two story frame structures with the main floor used for business and the upstairs used as living quarters for the family or rented out to boarders. After several fires it became apparent that wooden buildings lined up side by side were a hazard. As a result, a city ordinance was passed requiring that any new downtown buildings be constructed with nonflammable materials. First National Bank, 1881 First National Bank put up the town’s first brick building in 1881. Italianate style, diagonal entrance. Full front facade includes dentils in the cornice, curved window surrounds and decorative brick pttersn around the entrance. When First National was founded in 1872, it was the only National Bank northwest of Minneapolis. Within three years the bank outgrew this building and moved to a new building. This building became a saloon. In 1939, it became the Corner Bar which was a city institution for many years. Beall & McGowan, 1908 Last remaining building of the old warehouse district. Constructed as a wholesale grocery warehouse. Facade of red pressed brick. Interior has poured concrete floors supported by an innovative column system designed by Minneapolis engineer C.A.P. Turner. Beall & McGowan is the oldest known example of Turner’s design in Minnesota. Floor levels constructed to be kept at a consistently cool temperature for food preservation purposes. Daly & Gray, 1881 Charles Daley and Frank Gray came to Fergus Falls from Madison, Wisconsin in 1881 and constructed this building. It opened with a full line of ladies, gents, misses and children’s shoes, clothing, trunks and valises. The exterior was built to match the bank building as closely as possible. Cowing Store, 1881 Built at about the same time as the bank and Daley and Gray’s. Owner William Cowing constructed the 1882 Cowing House on Lake Alice, a fully restored Victorian style residence. Ole Hagen Shoe Store, 1902 The Autograph Block built by Ole Hagen as a retail shoe store in 1902. Hagen sold granite block to traveling salesmen with their names carved on them to raise money for the building. U.C.T. stands for United Commercial Travelers. Later occupants were Dotty Dunn Hats and KBFR radio. A fire destroyed the interior in 1911, but the exterior was saved. Pickit Block, 1893 Fire destroyed the top floor in 1918, remodeled into a two story building. Became Norby’s Department Store in 1951. From 1959-62, George Brooks was manager of KOTE radio which eventually became KBFR. Brooks went on to a distinguished career in radio and was even inducted into the MN Broadcasters Hall of Fame. There is one incident, however, he was not too proud of. When in Fergus Falls Brooks and several other downtown businessmen were looking for an on-air promotion near Thanksgiving. They decided to have a turkey drawing, so Brooks positioned himself on the roof of Norby’s and tossed a live turkey over the edge thinking it would fly gently to the street below. It didn’t quite work out that way as Brook’s described the bird “plummeting like a dive bomber onto the sidewalk.” Thinking he held it incorrectly, he tossed a second one over and…splat…onto the sidewalk. Brooks said they quickly found another way to pick winners of the turkey drawing. First National Bank, 1884 This remarkable building was constructed for First National Bank in 1884. Victorian Eastlake in style it has a raised main entrance flanked by polished granit columns. Intended to be a model metropolitan bank there were also offices for lawyers, retail stores and a meeting room for social organizations. For years there was a barber shop in the basement. First National sold the building in 1966 when they opened a new bank (site of Bank of the West). Gerald Rufer then purchased the building for his law firm. Federal Building, 1903-04, South Addition 1932-33 Renaissance Revival, uses brick, stone and concrete as building materials. Renaissance Revival characteristics include high basement of cut stone, raised brick corners and a mix of window surrounds tied together with keystones. Metal roof features ocular dormers. Doubled in size with addition to the south in 1932-33. Style of the original design was skillfully duplicated under the direction of architect J.A. Whitmore. Post office on main floor, federal district court rooms on the second. 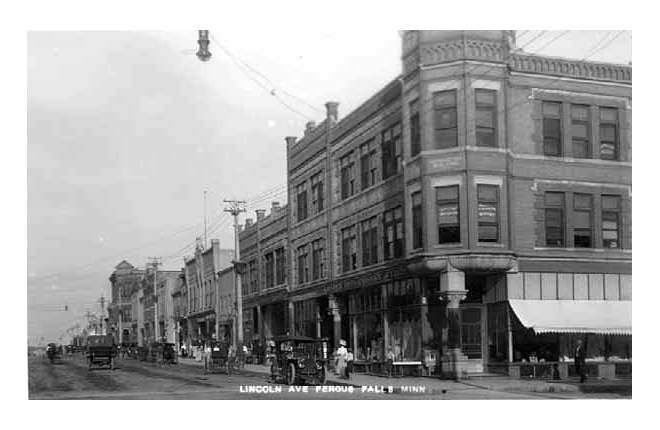 The 1928 winter session was moved to Detroit Lakes because hotel accommodations in Fergus Falls were considered inadequate.They would have moved permanently if not for the quick action of the FF Commercial Club which hired Vernon Wright to design a new hotel. One year later the River Inn was constructed and the District Court remained in Fergus Falls.